In June more than 4,000 engineering educators converged on Columbus for the American Society for Engineering Education’s (ASEE) 124th Annual Conference. It’s the only national gathering of engineering educators across all disciplines and from P-12 teachers to higher ed faculty, including a few presidents. The conference theme, “Where Engineering Education Takes Flight” was highlighted throughout the week, from the sharing of high-flying ideas to actual drone demonstrations. 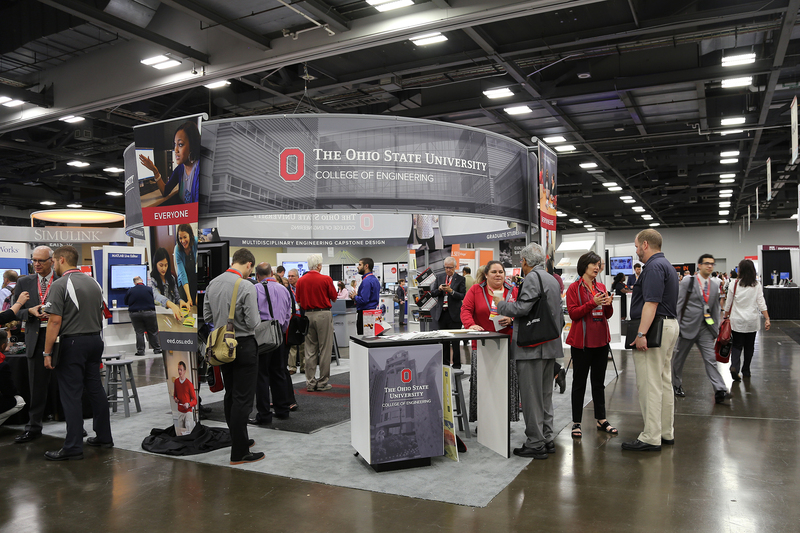 As host sponsor, the College of Engineering enjoyed several opportunities to publicize how engineering education is reaching new heights at The Ohio State University. “The 2017 ASEE conference was a grand success because the Department of Engineering Education (EED), the College of Engineering and Ohio State showcased our potential to become a hub of engineering education research and practice,” said EED Chair Monica F. Cox. To kick off the conference, the college hosted a community engagement activity focused on its popular Toy Adaptation Program. Participants learned how to reverse engineer popular toys by adding an adaptive switch that allows children with special needs to enjoy them. Along with providing tours of Ohio State’s campus, the college sponsored a division mixer and presented a distinguished lecture by Gary S. May, dean of Georgia Institute of Technology’s College of Engineering. EED also interacted with attendees on the exhibit floor and hosted a welcome reception downtown, amidst an exhibit that celebrated the unique relationship between art and engineering. Additionally, Ohio State faculty participated in nearly 20 presentations, lectures and talks throughout the week.